The Malaysia consumer confidence index continued to rise in the second quarter of 2018 (Q2 2018), up 23 percentage points from Q2 2017 to 117 points this year. 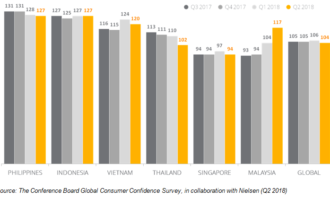 Malaysia is now the seventh most confident country in the quarter, up eight spots from the previous quarter. 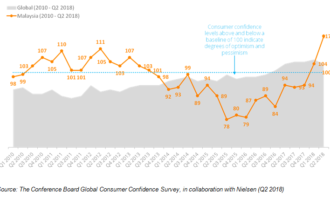 According to the Conference Board Global Consumer Confidence Survey done in collaboration with Nielsen, this is the highest recorded confidence score in Malaysia since the turn of the decade. The score can be attributed to post-election optimism and the “zeroism” of the GST. 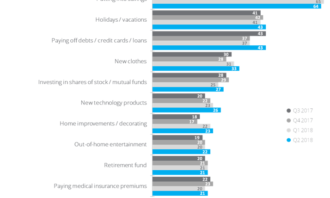 While concerns about the economy dropped from 47% to 40% year-in-year (yoy), the survey found that it still remains a top worry among consumers. There also appears to be a yoy rise in concerns about job security (26%) and debt (23%). Meanwhile, approximately 65% of Malaysians believe the country is currently experiencing a recession, a drop from 83% in Q2 2017. Of this, 75% expressed optimism that Malaysia will recover from the recession in the next 12 months, compared to 25% in Q2 2017. Also, Malaysians believe that the state of their personal finances (69%) and their job prospects (73%) in the next 12 months will be excellent or good, a significant improvement compared to 52% and 44% respectively, in Q2 2017. Malaysia (64%) was among the world’s top 10 countries where consumers are most likely to save their spare cash. 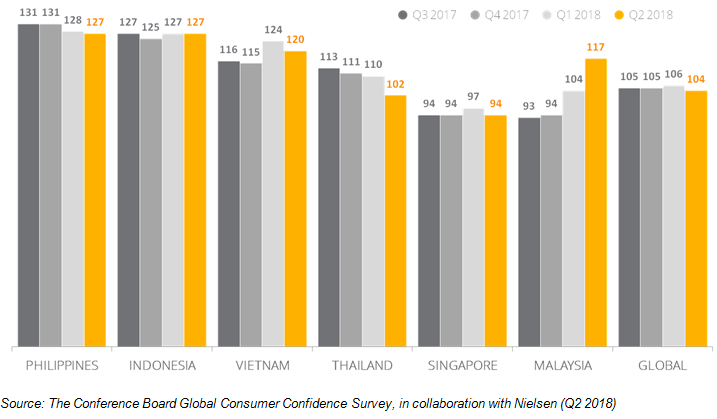 Nonetheless, 43% of Malaysian consumers surveyed also indicated that they spend their spare cash on holidays or vacations, up 2% compared to Q1 2018. The same percentage also intend to use the money to pay off their debts. 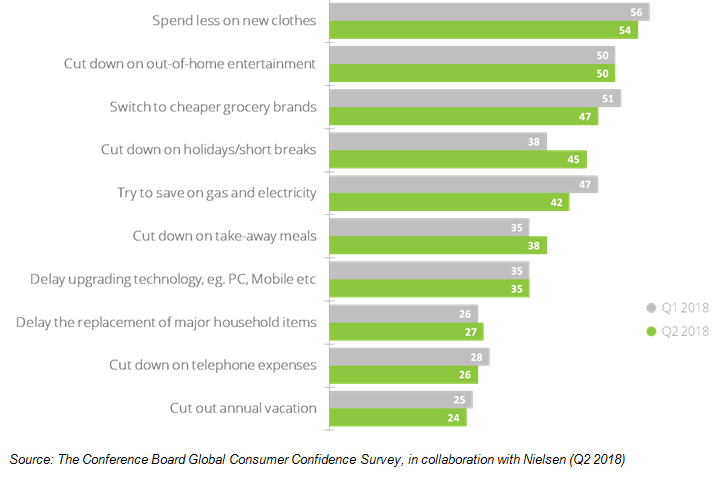 When asked if they have changed their spending habits in the last 12 months to save on household expenses, 84% of Malaysian consumers said “Yes”, with 54% of respondents spending less on new clothes. 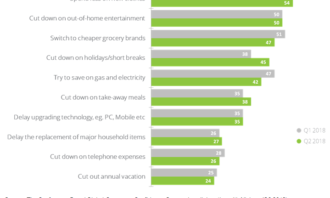 Additionally, 50% indicated they will cut down on out-of-home entertainment, while 47% said they will switch to cheaper grocery brands. Meanwhile, Hong Kong (72%) and the Philippines (71%) topped the list, edging out Vietnam as the top two countries with the most avid savers. Singapore (69%), Indonesia (66%), India (65%) and Taiwan (65%) also made it onto the list. 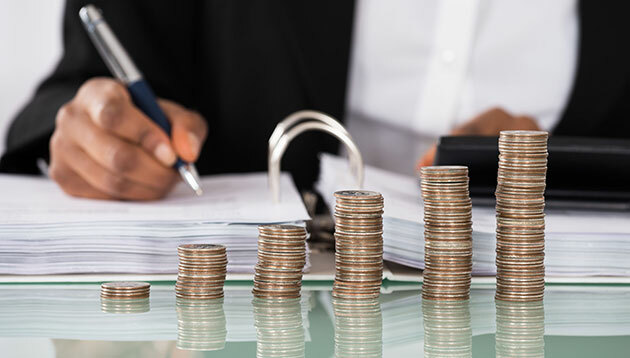 Globally, the survey noted that an average of 53% of consumers says that they save extra cash that they have after spending on essential living expenses. Nielsen Malaysia’s managing director Raphael Pereda said that while Malaysians see a bright future ahead of them, they are still grounded in reality and continue to express concerns on bread and butter issues. However, he noted that levels of optimism are significantly higher than they were a year ago. 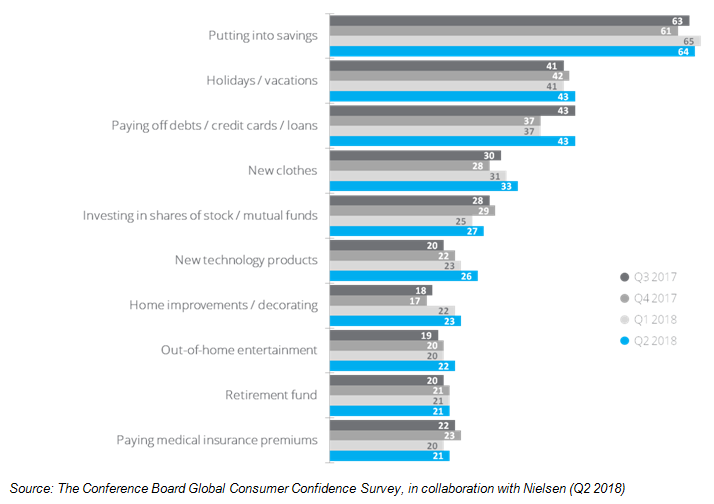 The Conference Board Global Consumer Confidence Survey measures perceptions of local job prospects, personal finances and immediate spending intentions among more than 32,000 respondents with internet access in 64 countries. 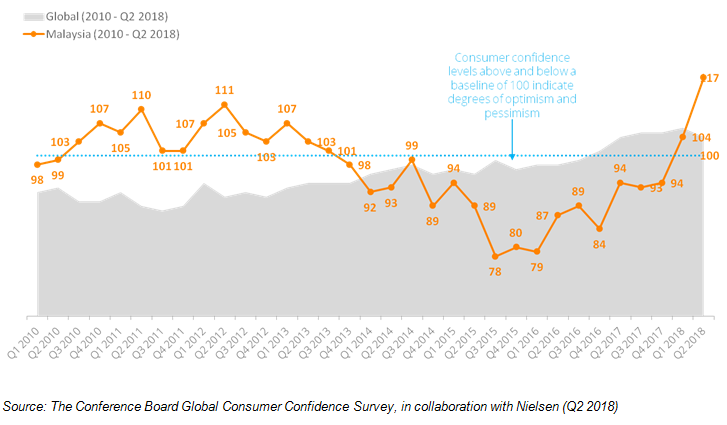 Consumer confidence levels above and below a baseline of 100 indicate degrees of optimism and pessimism. Telekom Malaysia (TM) has partnered with Malaysia Franchise Association (MFA), TM Info-Media and iProperty to bring its latest web..